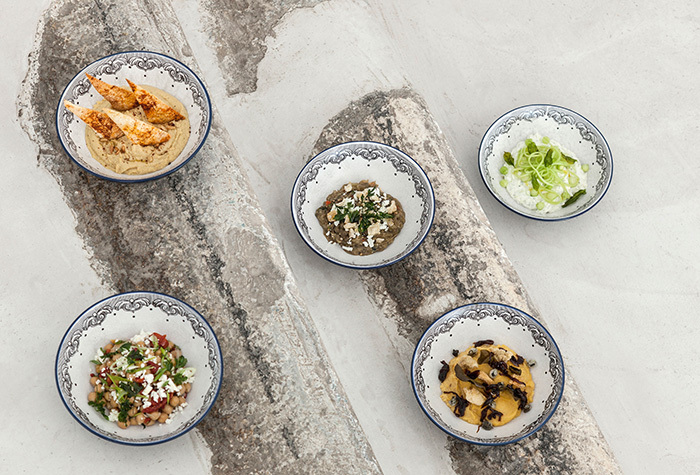 "Aegean Poets" employs the true Mediterranean principles of clean, elegant and fresh flavours, based on Greek traditions with undertones of Italy and France. 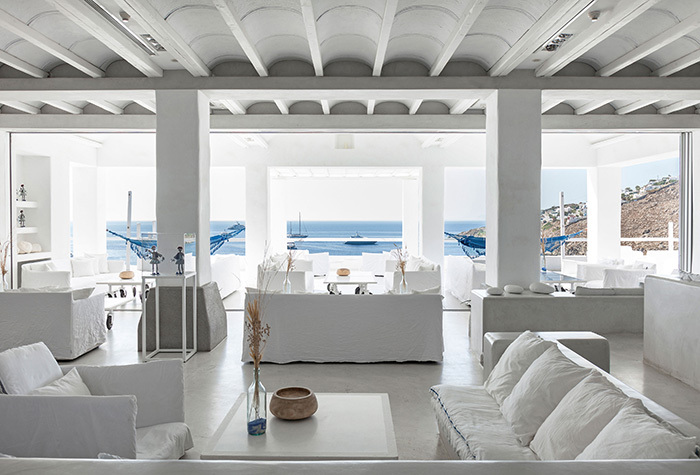 It connects to the outdoor life through large windows and enchanting verandas with panoramic sea views. 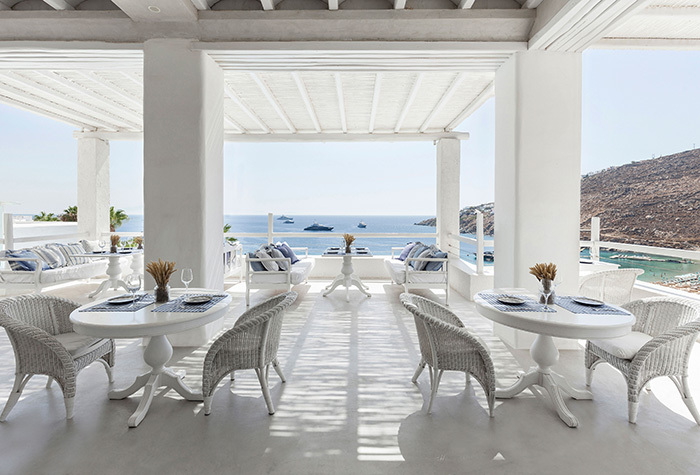 "Aegean Poets" is open for breakfast, a la carte lunch and dinner with delicious Greek and seafood specialities. Children's meal on request. ‘Eat breakfast like a king’! 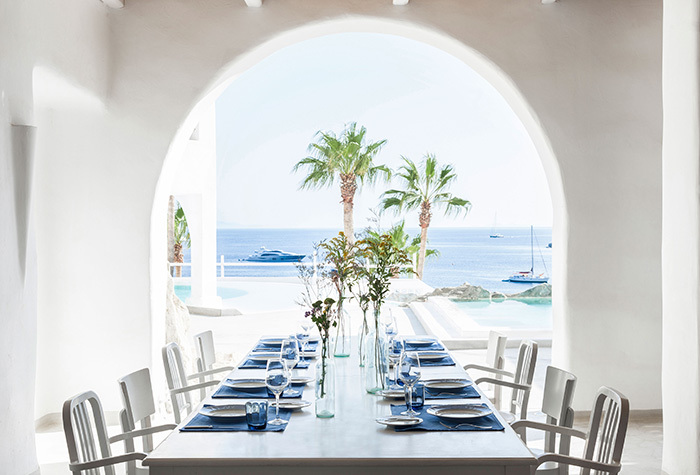 Grecotel is famous for its lavish breakfast spreads—proof that all guests are treated like royals. 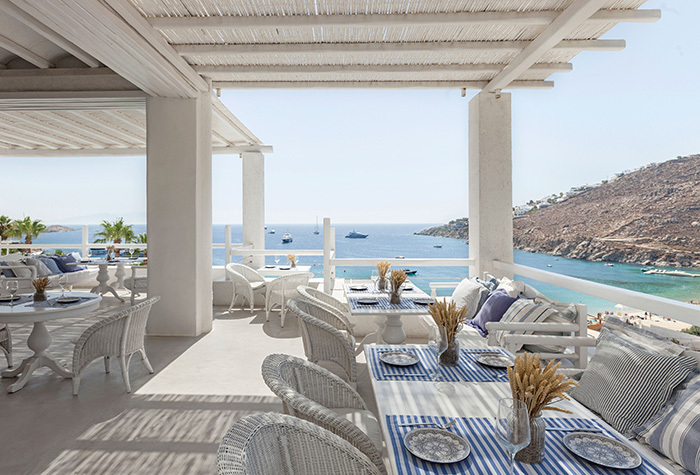 And the selection at the Mykonos Blu is truly worthy of empire, a mouth-watering buffet laden with an array of fresh fruit in season, just-baked breads, cheeses, yogurts, and other dairy, breakfast meats, cereals and muesli, nuts, home-made marmalades, honey and more—mostly organic and locally-sourced. It is the ultimate breakfast buffet selection. Seasonal isn’t just a key word: visit us in September and you might not find your favorite foods from June as grapes and figs take the place of apricots and cherries. 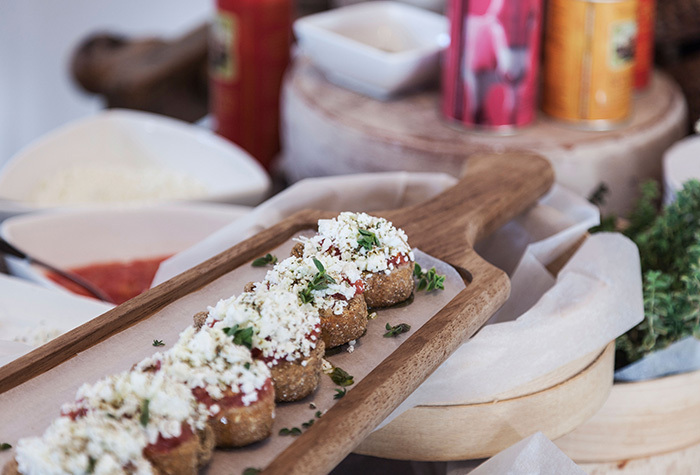 Only the freshest ingredients and the finest make the cut—literally, as we slice our home-cured meats on the plate just for you. But the real piece de resistance is the menu of made-to-order egg dishes that goes beyond feather-light omelets—and yes, we serve those too. These selections are truly divine, from a farmhouse-style Cretan scramble with vine-ripened tomatoes and oregano picked from our kitchen garden to an extraordinary version of eggs benedict with smoked salmon or bacon and poached eggs drizzled with truffle oil served with artichoke puree. Yum! "L’ Archipel" brasserie is an expression of fine al fresco dining in a place of outstanding beauty. 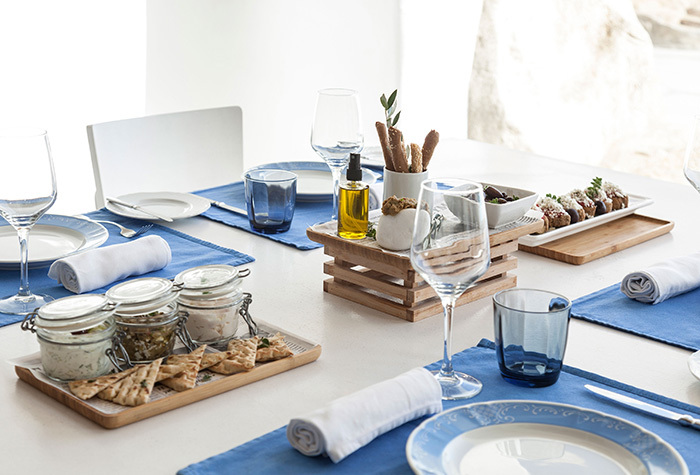 Enjoy contemporary seafood and a taste of the Mediterranean in a location which will stir the emotions. 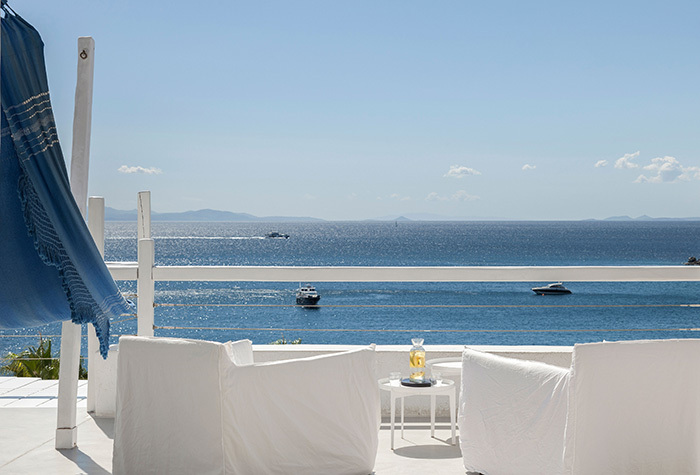 "L’ Archipel" tempts the most determined sunbather with delicious Greek flavours as the aromas of island food waft over the poolside veranda which overlooks the famous Psarou beach and the jet setters’ luxury yachts that dot the horizon. 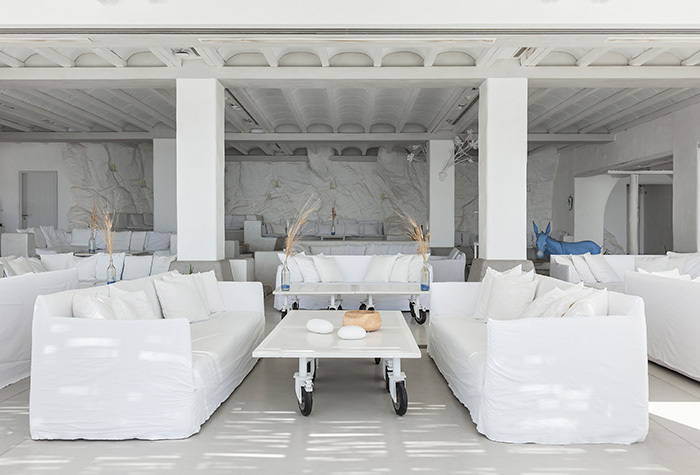 Breathtaking views, impeccable service and sumptuous décor are the keys to the success of the "Delos Lounges". Overlooking the pool, the gardens and famous Psarou Beach. Sip an ouzo or champagne as the sun sets or enjoy an after-dinner drink before heading off into town to get a taste of the island’s famous nightlife. Remixed by Mykonos Blu for your pleasure! So, what you should drink this summer? Υou can see its colour in the best hour of the day – sunset - it is waiting for you with passion fruit, caramel, lime and vanilla scented vodka. 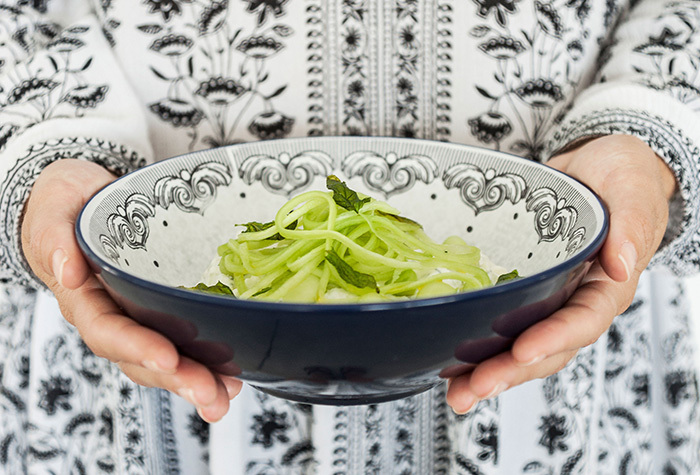 If you could capture the green hues of the Aegean, it would be with gin, spearmint, lime, cucumber and ginger. The color of passion, a symbol of love. Sip its secrets in a cocktail of vodka, strawberry and lemon jam. THE NIGHT IS YOUNG, THE AEGEAN IS MELTING INTO THE NIGHT. DIVE IN WITH blackberries, lime, white rum and soda. 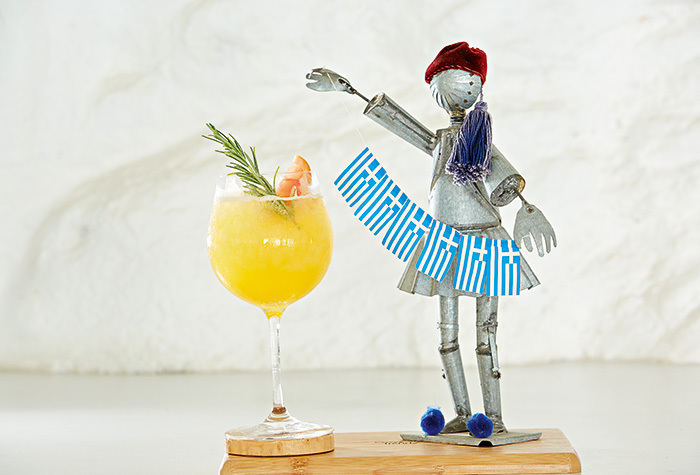 As the sun heats the Aegean Sea with its strong morning rays, try this spicy cocktail with tequila reposado, coriander seeds, mango, passion fruit liqueur and chilly. For some it is time for bed, for the ones who are “in the know” it is the best opportunity to see the Aegean’s beauty, taste it with white chocolate, oreo biscuit, vanilla syrup and vodka. Discover the Aegean inside your drink simply by stirring, it is hidden between mastic, basil, lime and triple sec. 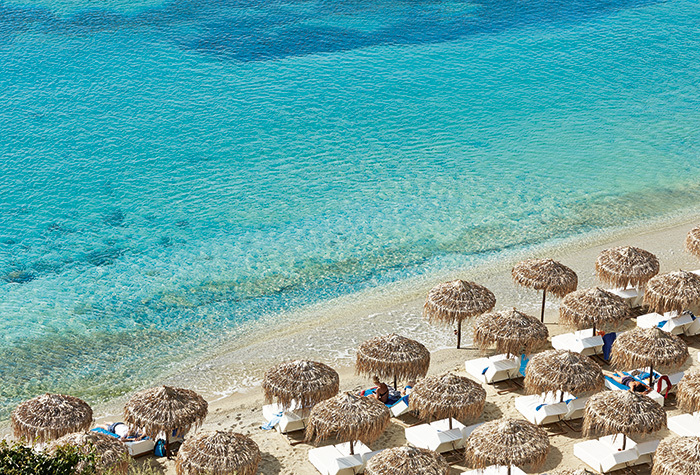 Enjoy the dazzling Aegean waters at the world-famous Psarou beach. 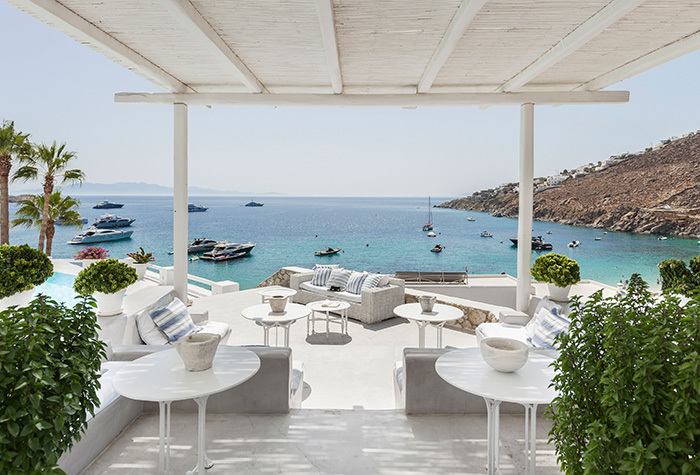 The most popular place to celebrate an invigorating dive or simply relax in the warmth of the Greek sun lying on the comfortable chaises longues. 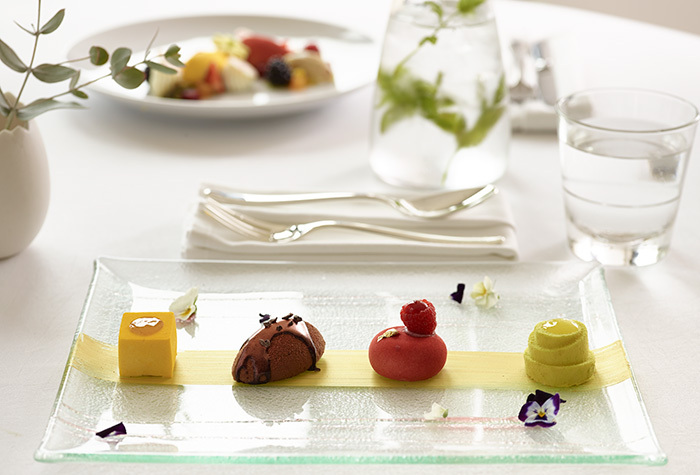 Refreshing drinks and a light snack menu are available throughout the day. Highlight: Ask the waiter to inform you for our creative cocktails or the exclusive beach menu with delicious food! Whether it’s pre dinner, social drinks, snacks, private dining, watching the sunset, lounging poolside or on the beach, there’s nothing more special than being able to enjoy a personalized dining experience with one of our options. Gastronomic delights are wonderfully prepared by professionally trained staff, ranging from fresh seafood to European delights. Intuitive service transforms your villa into the perfect backdrop for a candlelit dinner for two. Dining can be arranged in the privacy of your villa. It can be as formal or as casual as you wish. All details will be taken care of, from dedicating a waiter to serve you throughout the night, to creating a romantic atmosphere. A BBQ can be arranged in the privacy of your villa, a chef and waiter will tend to everything. Enjoy a romantic sunset dinner on the beach including a private waiter, personalised menu planning, a romantic beach location, imaginative décor and memories to last a lifetime. Enjoy the company of your family at a private dinner on the beach, which includes beach-style seating for up to 12, and torches. One of our chefs will prepare your chosen menu. Flowers and entertainment can be arranged to enhance your evening of fun, relaxation, and merriment. Daytime: Resort Casual. Cover‐ups are required for breakfast and lunch. Footwear is required in restaurants & bars at all times. Evening: Smart Casual. No beachwear or shorts in the evening. Gentlemen – long trousers and shirts with sleeves (short or long) are required in all restaurants & bars. Please inform the hotel staff in advance of any allergies or intolerances you may have. Our menu might contain traces of allergenic substances.